Just Published! ANS 38:4 Featuring “Veterans Health” articles! Given the recent history of international conflict and violence, the health and well-being of those who have served the military of any country world-wide has become a major challenge that influences the well-being of families, communities and nations. 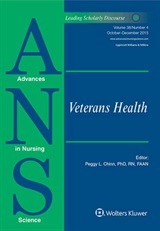 This issue of ANS includes four articles that address the health of veterans and their families, and a guest editorial that provides information about the U.S. military research programs that are addressing these significant challenges. 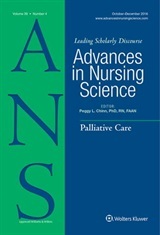 In addition, this issue includes a number of “General Topic” articles that extend the discourse in a number of areas of important nursing scholarship. Watch for our “Editor’s Pick” articles over the next several weeks, read the articles, and follow this blog to stay current with messages from the authors as they are featured!